Aerial view of tree islands in the northern Everglades. Photo courtesy of Flickr/Brian Garrett. Situated in the Florida Everglades and mainly accessible by airboat or helicopter are unique tree-topped geological formations that have baffled soil scientists for decades. Questions swirl around how they formed almost 5,000 year ago and how they maintain themselves. Scientists report exploring these islands, pushing past vines, and brushing away the topsoil. There they find that some of the rock beneath has holes like Swiss cheese with water and tiny fish living inside. These anomalies, known as tree islands, hold important ecological significance for the Everglades and beyond. 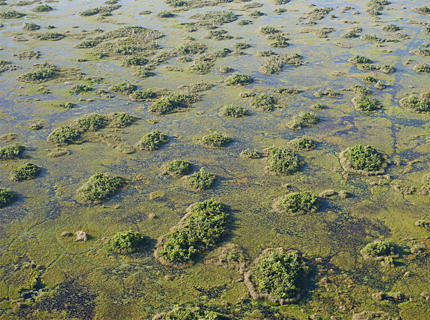 Once numbering possibly in the many thousands, these teardrop-shaped islands range between 0.25 to 1 km long and are found throughout the Everglades. Their ecological role, soil dynamics, and vulnerability to changes in water level combine to make them an extremely important—yet sensitive—feature of the landscape.